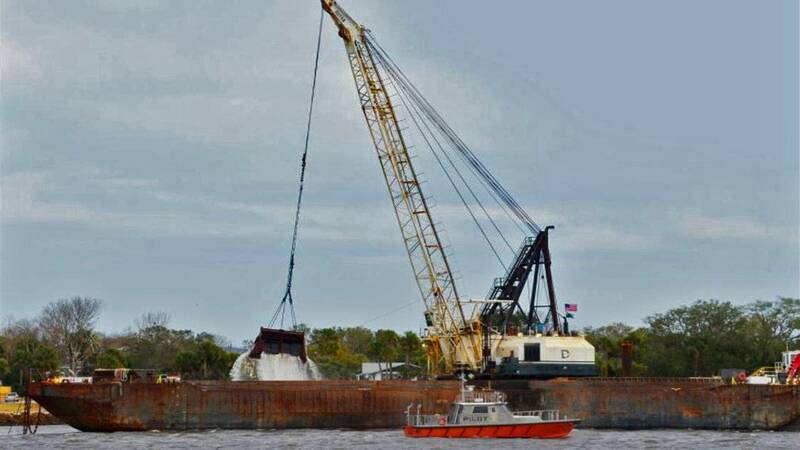 A clamshell dredger The Paula Lee makes the first scoop in the Jacksonville River deepening project. JACKSONVILLE, Fla. - A 20-foot hill lays under water about 4 miles east of Atlantic BeachM and it is growing taller. This is the dumping ground for silty muck and sand dredged from the bottom of the St. Johns River. The depth between the river entrance and the Mayport ferry dock will increase from 40 to 47 feet during the 16-month operation. Three million cubic yards of dredge material is will be dumped offshore in the first stage of river dredging. This equals 250,000 average dump trucks. Dredging the bottom maintains navigation in the river when sand and silt washes downstream into the river gradually filling it with sediments. Some of the sand pulled out of the river is used to renourish our coastline but often its not the right type of fill material suited for our beaches. Most is barged out six miles southeast of the river mouth and dumped in 20-40 feet of water at the Ocean Dredged Material Disposal Site (ODMDS). Most dredged materials consisting of rock, gravel, shell hash, silts, soft clays and sand mixtures. Pile of sand has grown since the first deposits were made in 1952. Since then the mound has remained mostly intact but some sand has shifted southward due to predominant currents flowing to the southwest in the fall and winter. Larger waves in the area are predominantly from the east and occur in the winter, which can re-suspension sediment on the seafloor even 40 feet deep.